Make quicker and more positive shifts with the ROUSH® Short Throw Shifter. This kit reduces shifting throw by 55% and fits 2005-2008 Ford Mustang GTs with the stock manual transmission. 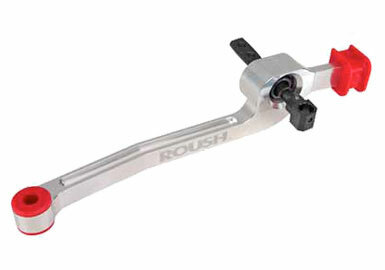 The ROUSH Short Throw Shifter includes both a ROUSH designed shifter body and a shifter arm. The shifter body is made from 6061-T6 aluminum, which is also used in many aeronautical and aerospace applications for its high level of strength and resistance to corrosion. The shifter body is CNC machined for precision and quality in the U.S.A. at ROUSH's machining facility. You can add a true retro look to your shifter with the ROUSH Billet Shifter Arm and Retro Shifter Knob.